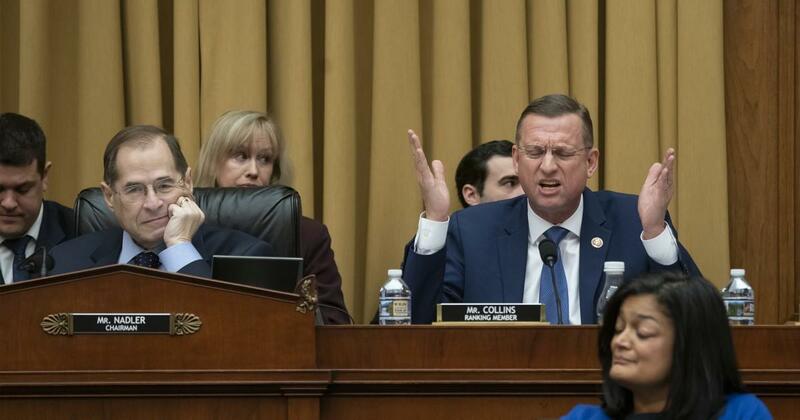 Collins notes that Nadler could compel AG Barr to provide the unredacted report if he launches an impeachment hearing, however the top Republican on the panel noted "Perhaps you are loath to begin an impeachment hearing when the facts do not support one." "Instead, you refuse to head down that path for political reasons, and have chosen the path of greatest resistance, and least legality - attacking the Attorney General for refusing to break the law while misleading the American public about what the law requires or allows." "Your decision to make groundless claims and repeatedly threaten to go to court not only distracts from other Committee business but, based on firm legal precedent, will also end -- after months, if not years, of litigation." Collins suggests that if Nadler isn't going to launch an impeachment hearing, he invite Mueller to testify "immediately." "For nearly two years, Special Counsel Mueller oversaw an investigation that issued more than 2.800 subpoenas, executed nearly 500 search warrants, and interviewed approximately 500 witnesses. Attorney General Barr was never part of this investigation, and instead simply reviewed the Special Counsel's final report and has provided Congress, so far, with the Special Counsel's principal conclusions." "I urge you to do the right thing, follow the law, and invite the Special Counsel to testify before the Committee immediately. Doing so ensures we will hear the unfiltered truth from a man who conducted his investigation with integrity and professionalism."